'If it ain't broke don't fix it... unless you're planning on making it ferociously better. That's exactly what Volkswagen has done with its refreshed Golf R', writes Janine Van der Post. Volkswagen has a winning recipe when it comes to its Polo, Polo Vivo and Golf. They're a brand that has, given its hugely popular range, figured out what the buying motoring public enjoy and thrive at making their products better with each new generation. The ubiquitous Golf and the budget Polo are the automaker's bread-and-butter, both sell volumes not only locally but in the case of the latter, are exported globally. Locally, Golf performance products have increased VW's market share quite significantly in the last five years, moving from 24% to 32.5% in the 'A Hatch' segment. Since the automaker launched the Golf 7 here in SA during 2014, it has sold 36 717 units and 4050 Golf R's to date. 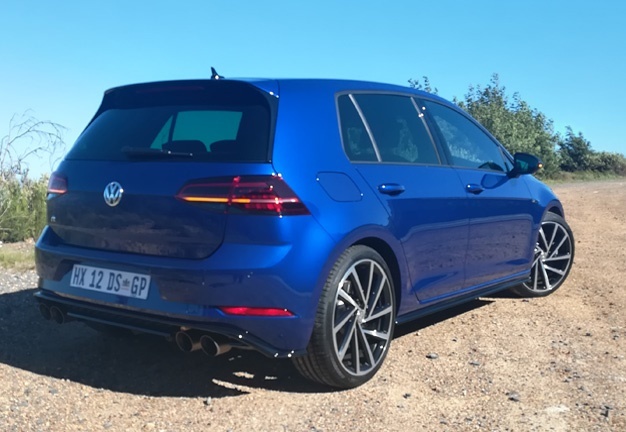 There's still a 2.0-litre engine under the bonnet but it now makes 228kW and 400Nm, the most powerful Golf R yet, it's mated to a seven-speed DSG and is still all-wheel drive. It sprints from 0 to 100km/h in 4.6 seconds and has a claimed speed of 250km/h. There's a host of standard features available, along with several optional goodies such as 'carbon' exterior side-mirrors, 'Nappa-Carbon' leather seats, and adaptive chassis control. Probably the biggest new feature on the refreshed model is its updated exhaust. Volkswagen says it has teamed-up with Akrapovic to create a Titanium Performance exhaust system unique for its new Golf R. It weighs 7kg lighter than the standard system and it gives the car completely new acoustics. The sound is intoxicating and addictive, especially at higher revs and when shifting gears. Akrapovic has created a sound typical of its products, meaning its tight, finally tuned and "not too loud". I beg to differ about that last factor, because that growling sound makes you want to hear it more and more by digging your right foot deeper in the corner. VWSA says the exhaust is linked to the car's sound system so it might sound a lot louder inside the cabin than what it really is. The thing is, it is loud, and it's absolute bliss. This does come as an optional extra and will cost an additional R39 900 on the standard price. There's also optional R Performance brakes with brake calipers painted black with the ‘R’ logo. Standard features include the 'R' designed bumpers, LED headlights and LED taillights. The tailpipes are placed further out to the sides giving the car a wider appearance. I had told my driving partner, who used to be quite nervous behind the wheel in the past, that even she seemed more eager than usual up Dutoitskloof Pass out towards the Boland. Once you get behind the wheel, you completely understand why. With 20Nm extra and 15kW more than before, the updated Golf R certainly feels terrific on the road. It's simply a very solid hatchback backed by great engineering. It hugs tight bends akin to a toddler clinging to his/her parent after a rough day at pre-school. Gear changes are exceptionally smooth as is expected from that engine and DSG 'box. And even though this is such a sporty car, it's still an incredibly practical offering as a family car or daily drive. More than enough to keep dad, or mom, happy with dynamic driving performance, loads of space and the utter love of the drive. The Golf 7.5 might be in its final year as the Golf 8 is already being tested internationally for global climate conditions, yet no reason why this won't be another performance hatch success locally. If I had the means, I would buy it, even if it's merely to listen to the sonorous melody emanating from the exhaust. Pricing for the Golf TSI R - R676 000.